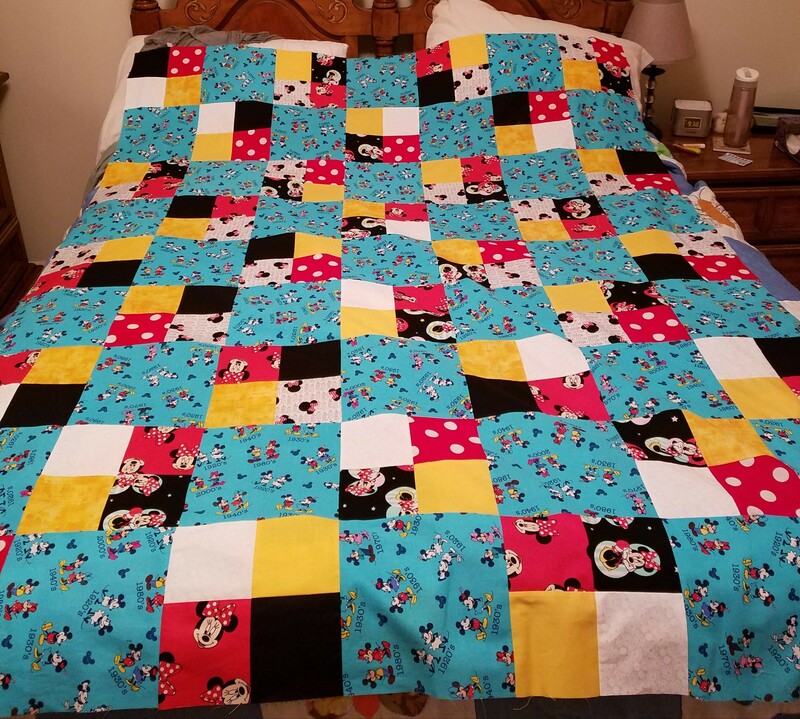 Thread: Need some quilting ideas, also, fleece backing? I've completed 2 tops for my boyfriend's parents as Christmas presents. My problem is how to quilt them. I know I could sitd, which I don't know if I want to do that. Other thoughts are to do a diamond pattern or a 1/4 inch on each side of the seams. I'm not confident in my free motion skills to attempt that. Any thoughts? Also, when using fleece as a backing, should I lengthen my stitches? You could do some point to point quilting with rulers. Just google Angela Walters Point to Point Quilting. I would do diagonal cross hatching. Lovely quilts. if your machine has the serpentine stitch, it is very forgiving. I use it a lot for both diagonal and 'in the ditch', I lengthen the stitch to 4 or 5. Rows of serpentine stitch can really look cute on a quilt. The serpentine stitch on my machine looks like a zig zag stitch except it has 3 stitches in each zig zag. When I increase the stitch length it makes the serpentine stitch. Angela Walters has YouTube videos on FMQing the continuous curve or orange peel design that makes a good pattern for use in squares also. If you are using fleece backing and no batting you don’t need the quilting to be close. You could do a cross in each square or continuous curves in each big and little square. It is easy to do and there are lots of tutorials available for it. 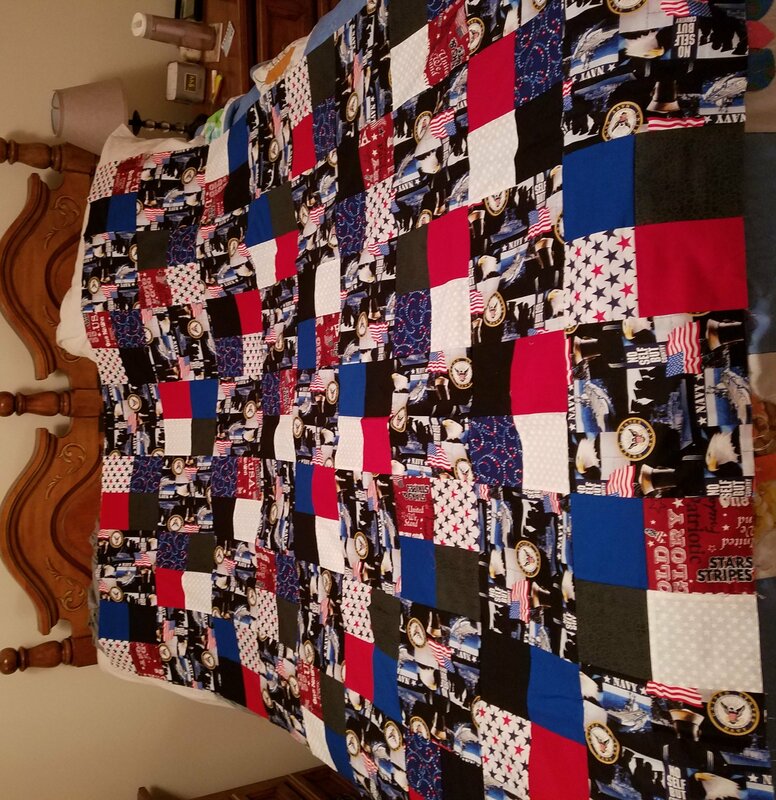 I think I might do the serpentine in the ditch on the minnie one, maybe some echo quilting on the patriotic one. Thanks for the suggestions everyone, and I will be putting a layer of muslin in between, the fleece pattern shows up on the white blocks, but that won't affect my quilt spacing, correct? There is really nothing wrong with a simple grid. Pick a diagonal and use painters' tape to make a straight line. Then decide how far away you want to make the next lines (3-4"?). Repeat going the other way. It looks fine and holds up well. For the Minnie quilt, curved lines from corner to corner in each blue block. a big X through each 4-patch. You can draw the curves on using a paper plate cut into a semicircle template. Draw with chalk Or Crayole Ultra Washable marker. For the patriotic one, a large serpentine stitch going horizontally to mimic a waving flag.Or stars all over, of varying size. They are easy to FMQ and forgiving when done in various sizes all over, connected by loose curvy lines. I like to do a diamond pattern. I think it has the least bulk for the harp. And, if you are not using a batting (which I assume since you are having a fleece backing), you might be able to do every other block with the diamond. Try it that way first because you can always go back and add the other rows. As for the fleece, good luck. I dislike working with fleece on anything because of its willingness to stretch every which way. I use fleece backing for all of my donation quilts. I use a regular length quilting stitch, but loosen the tension a little. Any straight line quilting works best...and the serpentine stitch comes out fabulous. I also use fleece backing on all my comfort quilts. I lengthen my stitch to 3, and I adjust the pressure foot to a lower setting. If I have to piece the fleece backing, I use a very narrow and long zigzag stitch to prevent the thread from breaking should it accidentally be stretched. I usually go with width of 1 and length of between 3 and 4. Since the fleece is fluffy, this slight zigzag is not noticeable at all in the final seam. I see you got your ideas nailed down. The quilts are so nice! I like both tops, very pretty. If you do the "inner" curve on each square, you may do the pattern in a long row and then turn and come back doing the same thing. Then do the same going in the next direction. Very easy but looks like a flower with 4 petals around each seam. Good luck. They are beautiful.